When I was a pre-teen, I had aspirations of attending college in Canada because I figured it would be a stepping stone to living in Paris. My eldest is taking French now and it feels like déjà by. Although she’s pretty studious, she has a deep longing for attending school abroad. – either in Japan or in France, and thus devoted countless hours studying second languages. While preparing our curriculum I saw the emergence of numerous patterns, one of which was the seeking of refuge abroard so that the artist, aviator or doctor would have an opportunity to learn their craft and live their purpose in a less racially charged society. This was true for Dr. James McCune Smith who traveled to Glasglow, Scotland to attain his medical degree, as well as, Bessie Coleman and Josepbine Baker who both traveled to France to get closer to their dreams. 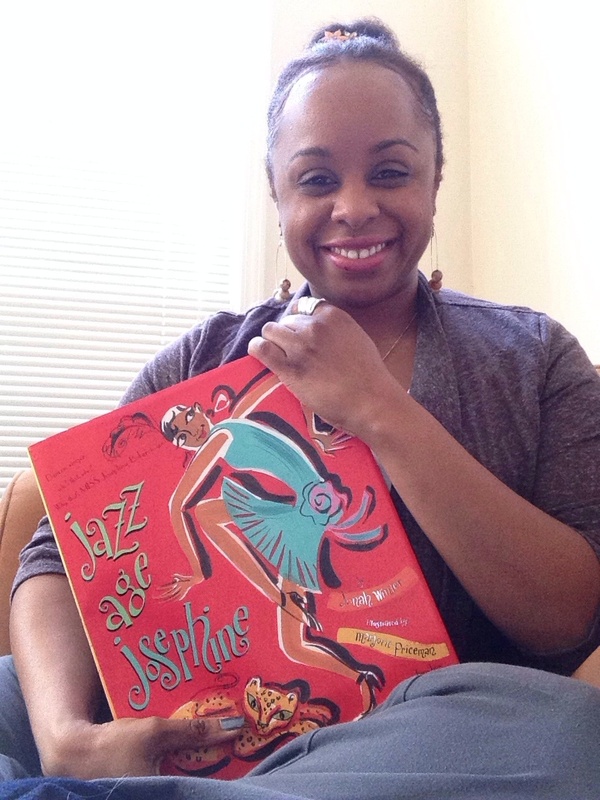 Josephine Baker’s escapades are vibrantly captured in Jonah Winter’s Jazz Age Josephine by illustrator Marjorie Priceman. The sing-song passages evoke a musical tone as the story is read aloud, especially during the portionso devoted to tackling the racial discrimination which spurred Ms. Baker’s exodus from the United States. This is title is part of our Reading List for the 20/20 curriculum for the lesson on the Celebrity, which illuminates how some African American stars have utilized their fame and influence to further philanthropic endeavors. With metro Atlanta children stranded and schools and motorists stuck on our highways, there has been loads of fingerprinting about who is responsible. Putting away the well deserved frustrations aside, this confluence of hilly southeastern terrain, torrential arctic blasts and overextended transit to and through the city converged to create what some are calling a perfect storm. The educator in me sees an AWESOME social studies lesson on how government works, and should work. Research the roles and responsibilities of the following political leaders: state governor (Georgia), city mayor (Atlanta) and superintendent of schools (state of Georgia, Atlanta Public Schools, Cobb Public Schools, Fulton Public Schools). This information is available online on government sites and within the state’s laws. Identify who these leaders are and what were their responses to the storm and resulting transportation issues. There are numerous interviews available online of many of these leaders. Do you believe that the decisions these leaders are empowered to make are sufficient to deal with weather emergencies and transportation/traffic? Do their respective functions require that leaders collaborate with other leaders? What recommendations would you make for them in respect to their leadership? Presentation: Package this research together into an infographic to include quotes, a breakdown of the leaders’ responsibilities and a timeline of their responses to Atlanta’s Snow Storm of 2014. Again, this activity can be re-structured to meet the learning styles and needs of your learners. Have fun with the graphic design – snow, snowballs, transportation, buses, schools. And Now We Are Cooking With Fiyah! It just hit me that I use food as a learning too. While teaching a unit on Germany, I had a group of German students, arranged by the local consulate, visit our class and while there we had a taste-testing of some German fare. Although I cannot profess to being a great cook, I realize that my creative juices are inspired to look at every opportunity to connect content. Case-in-point, the Tex Taco Chicken Tortillas the girls and I had for lunch while preparing our cowboy lesson related to the book Thunder Rose by Jerdine Nolen. Combine first 3 ingredients and cook for 4 hours on low in a slow cooker. Spoon cooked chicken onto tortilla chips. Extras for Topping: Cheese, sour cream, olives and jalapeno slices. I think that I am inspired to create Mommie-And-Me Cookbook based on some of our favorite stories. Wouldn’t that e a hoot? Earlier this year, my sixth grader participated in a collaborative project in her language arts class called MVP. In small groups, students had to research the life and achievements of a famous person to compete in a dialogue to ascertain which group represented the most valuable person researched. This exercise involved using critical analysis to select profound contributions in an individual’s life story which have impacted the broader society. My daughter’s group was assigned Muhammad Ali. For our 20/20 Tapestry African American History Curriculum, we too have selected Mr. Ali as an MVP to represent The Champions. Within this group, other notable athletes who broke barriers on and off the field are also represented: Arthur Ashe, Serena Williams, Joe Louis and Wilma Rudolph. Whether gender or racial discrimination, or even physical illness, The Champion is one whose journey resonates with the masses because they have overcome a great deal to achieve greatness. The Champion transcends physical prowess and is more than the sum of hours in the gym and relentless training. The Champion is a conqueror of their inner strength and is one whose focus and sheer will has positioned them to only be defeated by themselves, and not their opponent. Outside of the ring, a true Champion, exhibits humility and compassion, cares for the community that has birthed and nurtured them and expends their talent and treasure providing their hand as a resource to assist the next generation in their progress. Our curriculum has twenty visionaries – writers to visual artists and entrepreneurs to thought agents; all of whom have provided an integral thread in the African American tapestry. If you were adding to this curriculum, how would you decide who to include? Is there a person you think we should add the curriculum? Share your thoughts. Strong communities are comprised of strong families. Whether measured by empirical data or the personal narratives of individual families, there is something that is true no matter how we look at it: Families need support. There is more than a scintilla of evidence which suggests that there is at least a correlating relationship between parental involvement, student academic performance. And there is evidence that schools with high achieving students are positioned within stable, thriving communities. What if these factors were all tied together: student achievement, stable communities and parental involvement? 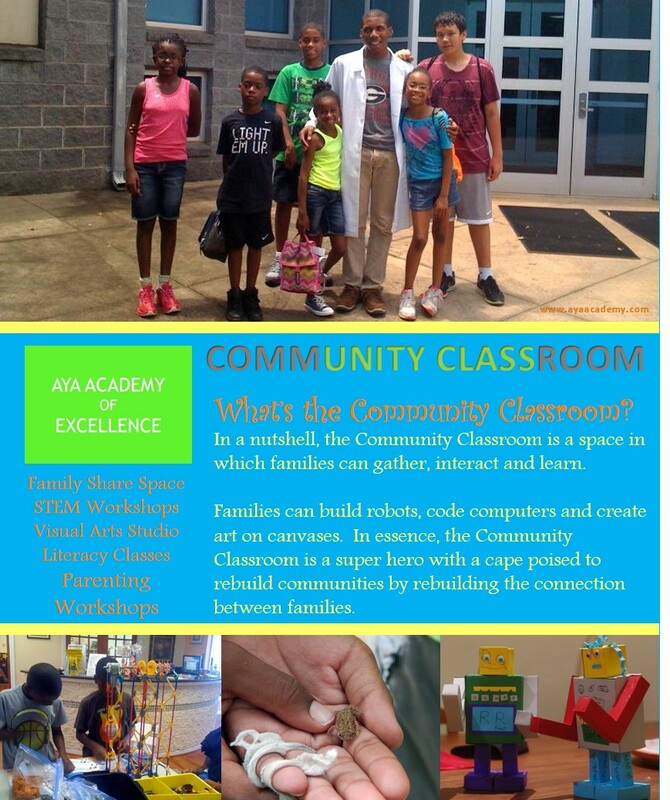 At Aya Academy of Excellence, we are in the midst of creating a new model of learning, which will support students’ academic learning in school – or at home, by providing a maker space in neighborhoods which lack out-of-school academic opportunities. Through our Community Classroom we will provide an open share space to provide families opportunities to participate in interactive workshops related to STEM, literacy and art. On weekends or after school, families can visit the Community Classroom art studio, robotics lab and literacy lounge. Together, parents and children can build robots together, learn how to code programming and create art. To support schools, the Community Classroom will partner with local schools to provide staff training on students engagement, parental involvement and content learning. There are some awesome maker-spaces developing around the nation in schools and libraries for a variety of reasons. We envision that the Community Classroom will be informed by the existing success stories, and will establish an enriching model communities can emulate to rebuild families and communities. When I began teaching in the 1990’s I had the great fortune of experiencing baptism by fire. Although my alma mater, the illustrious Hoftsra University boasts one of the most laudable teaching preparation programs in the nation, very little can prepare you for becoming a middle school teacher in a community grappling with severe issues of poverty, drug use and crime. Every issue a community faces is reflected in the lives of its children and as a classroom teacher, these issues become ones that must be recognized and faced. Understandably, while students are juggling immense socio-economic family and community issues, academic advancement becomes challenged. Author Eric Jensen’s Teaching with Poverty in Mind: What Being Poor Does to Kids’ Brains and What Schools Can Do About It, discusses how parental academic achievement, and specifically the areas of vocabulary acquisition and executive function, impact the learning of students. In a nutshell, parents are the springboard to their children’s learning. What parents know and the academic norms they possess, can affect how well a child will learn. So in 1996, when three eleven year old boys ‘would not’ pay attention or participate in our guided reading activities, I had to learn through experience that their inability was attributed to the text being inaccessible. Although they were in the sixth grade, they were each reading several grade levels behind. One student could not sound out the word ‘great’ in a social studies passage on Alexander the Great. At that moment, I realized that the text was a hindrance and headed to the local library where I scoured the shelves for picture books on the ancient civilizations we were studying. By using fiction and non-fiction picture books, the content was accessible and my students were able to cull historical information about ancient Egypt, China, Greece and Rome. Picture books, as mentor texts, are bridges parents at home and teachers at school, can use to provide context for science or history content. When I home-schooled my daughters, we read a few picture books each week on historic figures, including Eleanor Roosevelt, Mandela and Wilma Rudolph. The vivid imagery helped build engagement and the shorter passages meant that we could dive into another person’s life at least every other day. For our 20/20 Tapestry Curriculum, we have a list of picture books suited for the study of African American history. Our curriculum is divided into twenty lessons, each uncovering a specific archetype – moguls, inventors, champions, etc. During our journey of discovery of The Trailblazer, we investigate the American cowboy through the adventures of Bass Reeves, Stage Coach Mary Fields and Nate Love. 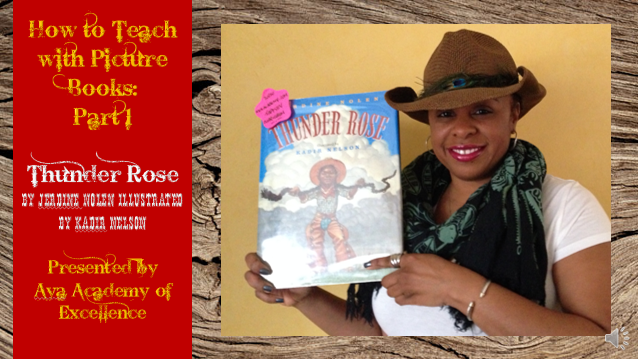 Check out our video to learn how Jerdine Nolen’s Thunder Rose can be used to teach language development and history, all while engaging young listeners through an interactive approach. While curating images and videos to represent our African-American history tableau, my conscience was constantly pricked, realizing that sometimes the ‘least of these’ is forgotten in our history. Black History month focuses on a handful of notable leaders. But this reality of parsing through history is true across United States and global history too. So when I came across a profound Polish proverb about the farmer’s role in society, I had to include it within the 20/20 Tapestry which highlights the contributions of George Washington Carver. It succinctly addresses the importance of the farmer within society. To me, quotes and sayings are excellent vehicles to critically think within the classroom or around the dinner table. Aya Academy of Excellence’s 20/20 Tapestry Curriculum includes at least one word of wisdom for each lesson to be used as a warm-up in the school setting or as a prompt for parents to use as a conversation starter with their children. Some of my personal favorites from the curriculum are from Maya Angelou, Cicero, and Malcolm Gladwell. The imagery used in this quote, and throughout the curriculum, helps to convey the raw emotion connected with the words. What will kids feel when they see and hear this picture and the accompanying words? 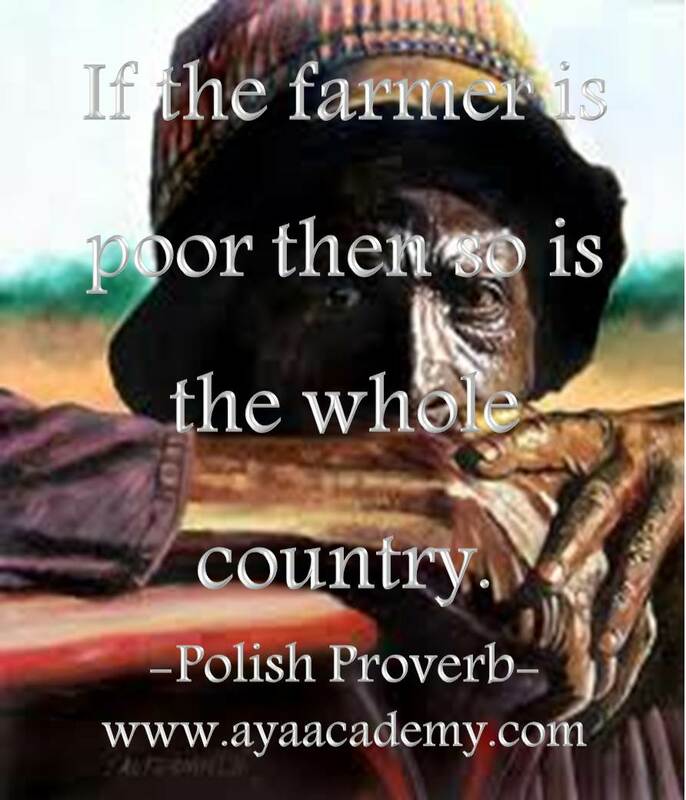 And, more importantly, what does this proverb tell us about the status of farmers? Is poverty monetary or are riches based something less tangible, like our quality of life and overall well-being? Through quotes, highly complex topics, such as social status, can be introduced to even the youngest of learners. And often, there is no right or wrong response. Quotes allow for increased critical thinking in a highly, accessible fashion because they spark both thought and discourse. Click on the link to view a sample lesson from our point-and-click African-American history curriculum. Proceeds from the sale of our curriculum will provide support for our programming, including our Community Classroom, which is a share space that enables families to engage in STEM, art and literacy together. Thank you for supporting our youth and families. Today’s generation has undoubtedly heard of Dr. Martin Luther King and Rosa Parks. But if you were to poll a group of young people, how many African-American’s who have made history do they know? More importantly, how many of them connect significantly with this illustrious group? Aside from slavery and the Civil Rights Movement of the 1950s-1960s, many Americans classify the existence of African-Americans as pretty much non-existent. And aside from a few factoids, adults have little more knowledge than the young people in our lives. How can this be changed? For one, it’s important to teach the way kids learn. Aya Academy of Excellence’s 20/20 Tapestry Curriculum is a point-and-click digital experience that allows learners to engage with the last two hundred years of the African American legacy by listening to songs, viewing film segments and participating in project-based learning. The curriculum is grouped into twenty decades and corresponding archetypes. So whether a student is intrigued with sports or science, there are high interest categories and activities to immerse their leaning. A highlight of the curriculum is its adaptability to learning at home or in a classroom setting. Therefore, families can gain access to the learning just as readily as their local schools. Imagine students hosting spoken word cafe’s, leading neighborhood clean-ups or creating a community recycled art installation. The 20/20 Tapestry Curriculum transforms learning to suit the engagement of today’s learner. By the time youth, their families and their class complete their studies, they would have participated in twenty field trip experiences, hands-on service learning activities and art integrated lessons. For youth working in their communication development, a writing prompt is included with each lesson. The 20/20 Tapestry Curriculum was developed by Aya Academy of Excellence as an opportunity to extend their academic outreach. Sales of the curriculum enable Aya to provide their services, including the Community Classroom which will provide youth and their families a maker space in the Atlanta area. For a Preview of the Curriculum, Click the Image Above. What’s Better Than an Apple for a Teacher?